The Necromongers are a space cult death army in the Riddick movies. 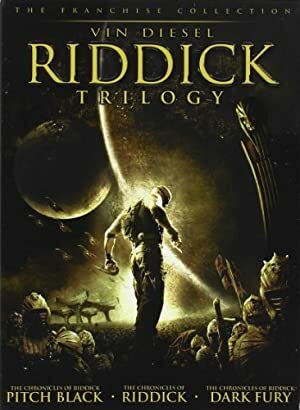 If you’re not familiar with these, please read our Riddick character profile first to learn about the greater context. Thanks. The Necromonger cultists have undergone a conversion process instilling devotion to the Necromonger way. This process supposedly also diminishes the ability to feel pain, though this makes little noticeable difference in the converts’ ability to withstand physical damage. The basic ground tactics of Necromonger troops are to send in spearhead groups to break enemy lines and allow captains to deploy Conquest Staffs in the enemy’s midst. The main body of the Necromonger troops will flank the enemy while they are distracted by the spearheads and fall upon the broken enemy formations once the Conquest Staffs have shattered their cohesion. The more skilled fighters among the Necromongers are eventually be promoted to captains or elite guards. Captains are mid-level officers who serve as flag-bearers to rally the troops and tell them what direction to charge rather than providing any notable tactical direction. The captains’ Conquest Staffs serve as a banners of leadership as well as suicide weapons. The elite guards are groups of exceptional troopers who are used for high-importance missions. Those few captains and elite guards who survive long enough to demonstrate truly exceptional combat prowess or reasonable tactical competency are often raised to the position of Lord, second only to the Lord Marshal himself. Lords serve as field commanders, leaders of missions separate from the main body of the Necromonger fleet, and strategic advisors to the Lord Marshal. Necromongers who suffer debilitating head wounds are converted into lensors. Lensors have very limited intellects, so much so that they need handlers, but their enhanced sensory abilities allow them track down survivors in the ruins of places conquered by the Necromongers. A lensor can detect living beings in their vicinity, even through solid rock, and can differentiate between converted Necromongers and normal humans. They also have visual magnification abilities sufficient to observe items in orbit from the surface of an Earth-sized planet. Their armor includes a hand-held control unit attached to the lensor’s back by an electronic cable which allows their handlers to direct them and see what they observe, including play-back of previously viewed events. The Necromonger fleet has two types of troop transports. The bulk of their soldiers are carried in Warrior Ships, which land and disgorge thousands of troops. Smaller Sarcophagus Troop Transports — so named for the sarcophagus-styled relief carving on their dorsal surface — hold approximately two dozen soldiers, deploying them with gravity-field assisted airborne drops. The Sarcophagus Transports are relatively fragile. A single man-portable anti-ship missile is sufficient to down one. But they are still valued for their ability to precisely deploy select ground forces. The Conquest Icons are 500-foot-tall three-sided towers topped on each side with gigantic busts of mournful hooded faces. The Icons hold three racks of 50 aerospace fighters on each side for a total of 450 fighters. After embedding themselves on the target planet’s surface the icons deploy the fighters. When the conquest of a planet is complete and all of its people have been converted or killed, approximately two-dozen Conquest Icons will be left behind to deploy their devastating explosive effect. This renders the planet’s surface uninhabitable, with the Icons remaining as testimony to the Necromongers’ work. The flagship of the Necromonger fleet is the Basilica, which holds their capital city of Necropolis within. The fleet also has several frigates, faster vessels that can be sent on independent missions as necessary. Due to their use of gravity drives, Necromonger vehicles that suffer catastrophic damage tend to implode rather than explode. The larger vessels use the quasi-dead psychics to communicate in real time over interstellar distances. 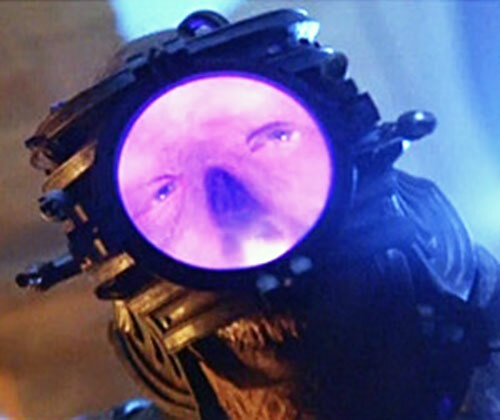 A quasi-dead on each ship will psychically link and then each will parrot the words spoken to the other. A presentation of the Necromongers. It’s very short, which is good – but in a lower resolution than our usual video selections on writeups.org. Sorry about that. The Necromongers were a death cult. Their primary tenet was that death was the Threshold beyond which was Underverse, a paradise of which the living world was only a pale reflection. However, Underverse was only open to true believers who fought to bring the gift of death to others until dying in their own due time. The death cult forbade reproduction, so every Necromonger was a convert. The highest rank among the Necromongers was Lord Marshal, absolute leader of the Necromongers. Below the Lord Marshal were his council of Lords. The lesser leaders in charge of troop units were called captains. The latest Lord Marshal traveled to the Threshold, which was not only a euphemism for death but apparently had a physical manifestation as well. There, he became one of the Half-Dead, journeying through the Threshold and gaining superhuman abilities derived from manipulation of his own astral body. After the Necromongers had replenished their ranks with converts and wiped out any remaining resistance, they would laid waste to the planet’s surface. They used their Conquest Icons so that nothing would ever live there again. The Lord Marshal would personally depress the trigger that activated the Conquest Icons from his command ship, Necropolis. The Necromongers’ reign of terror ended when the outlaw Riddick killed the Lord Marshal. 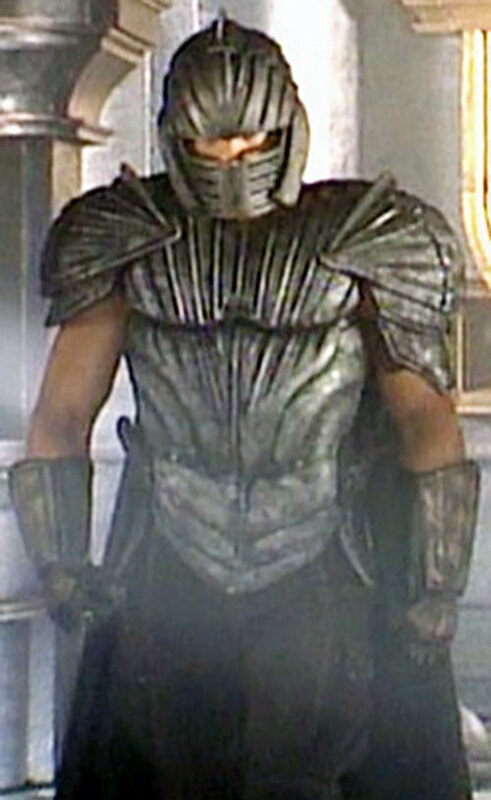 Following the Necromonger credo of “You keep what you kill”, Riddick assumed command of the Necromonger cult and withdrew them from their campaign of conversion. Necromongers were all physically fit humans. 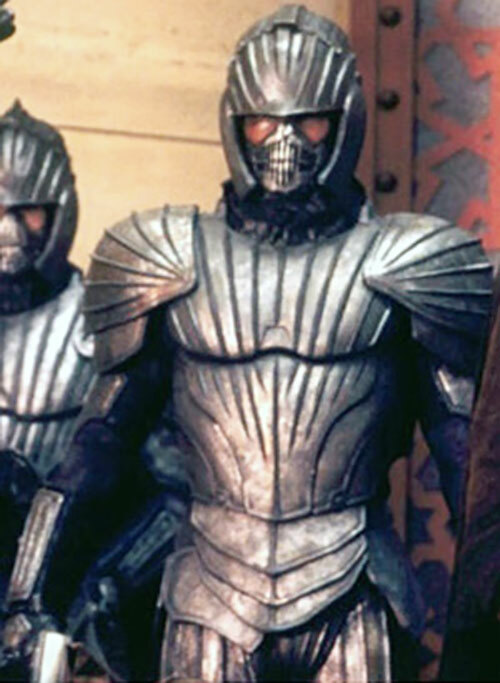 They wore full sets of plate armor made of a more flexible material than metal that had a dull silver color. The armor had lots of sweeping lines and ridges. The mouthpiece covering the lower face had a vertically stretched death’s-head grin. Some of the more distinguished Necromongers such as Irgun the Strange and Vaako either went without the mouthpiece or shed all head covering entirely. When a Necromonger’s neck is bare, one can see one-inch wide circular scars on either side of the neck where electrical probes were inserted into the spine during the conversion process. Lensors had the same torso armor as Necromongers, though the color was darker. The lensors’ exposed skin on their arms, necks, and craniums was often heavily scarred as a result of their injuries and they seldom if ever had hair. Most of their heads besides their upper cranium and their jaw was covered by their surgically attached sensory apparatus helmet. The centerpiece of it was a large magnifying lens over the upper face. The lens had purple backlighting emanating from within and its magnifying qualities enlarged and emphasized the mutilated faces of the lensors. This disturbing sight was further enhanced by the sibilant respiration machines often used by the lensors. This made their breathing sound like the liquid rattle of congested lungs run through a tinny speaker. The lensors’ hunched postures and stilt-like walk made their body language much like that of a large bird. The only utterances made by a lensor are a rapid clucking noise when it picks up a trail and a keening wail when it spots a threat. The lensors’ handlers control them via hand-held units cable-connected to the base of the lensors’ spines. These control units look like oversize game console controllers with small viewing screens that let the handler see what the lensor perceives. Necromongers were absolutely devoted to the cause, with few showing any independent thought at all. Their fanaticism was bolstered by the conversion process. Even strong minded individuals like Lord Vaako only considered betraying the Lord Marshal because he feared the Marshal was not faithful enough. Some people like the Lord Marshal and Dame Vaako do seem to be able to sublimate the conversion to their own desires for power. Others like Kyra and the Purifier were able to break free of the conversion for brief periods. It is possible that the process did not take as well in certain people. In DC Heroes terms that would lower the CIA noted in our game stats to an SIA. The lensors were very much like tracking dogs, both in their behavior and the manner in which they were led by their handlers. They usually didn’t do much on their own, but would “go on point” if something unusual caught their attention. The Necromongers could emerge almost anywhere in the DCU. 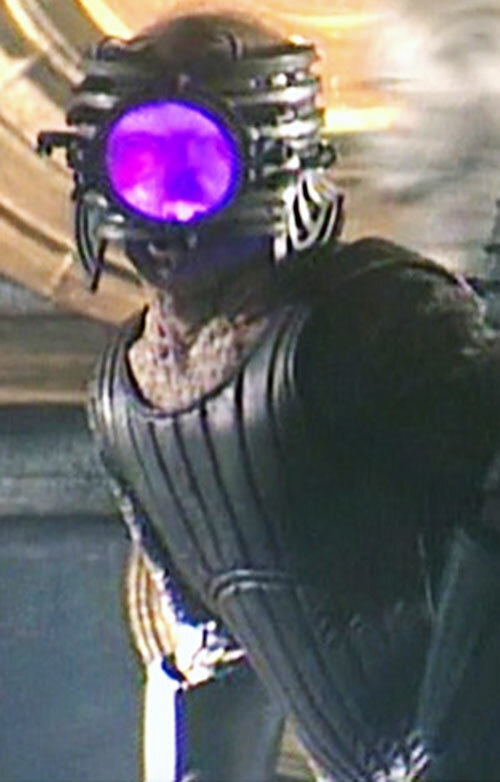 They could come from space either as a modern-day threat or plague the LSH era in the same way that the Dark Circle did. They might also be encountered as a cult of Earthly origin, perhaps in competition with the cults of Baron Blood, Kobra, or R’as al Ghul. Vehicles (Air, Space)*: 03 or Weaponry (Firearms, Melee)*: 03, depending on whether or not the trooper is a pilot or infantryman. CIA (Serve the Necromonger cause), MIA (Use melee weapons instead of ranged weapons). ARMOR [BODY 06, Skin Armor: 01]. Short Sword or Axe [BODY 06, EV 03 (4 w/ STR)]. Gravity Gun [BODY 04, Energy Blast: 06, Super Breath: 04, Range: 03, Bonus: Energy Blast and Super Breath are Combined Dice Actions (Energy Blast is the main Power), Limitations: Neither Power has Range — use listed Range instead (-1 FC each), Super Breath only has a 0 AP wide corridor instead of the standard 1 AP corridor (-1 FC)]. Vehicles (Air, Space)*: 04 or Weaponry (Firearms, Melee)*: 04, depending on whether or not the captain is a pilot or infantryman. Credentials (Necromongers, Low), Iron Nerves. A few outstanding specimens may also have other talents at the GM’s discretion; Irgun the Strange (an unusually capable captain) had the Schtick (Paired Weapons – Axes), for example. Credentials (Necromongers, Medium), Iron Nerves. The most capable of the Lords will have even higher stats than these; Lord Vaako had DEX and DEX-Linked Skills at 06 APs, 35 HPs, and Jumping: 01. Credentials (Necromongers, Medium), Iron Nerves, Scholar (Necromonger faith). CIA (Serve the Necromonger cause), Strange Appearance, Misc. Drawback (Lensors are likely dependent on their armor for life support and will die if it is removed). LENSOR ARMOR [BODY 06, Acuity: 06, Data Storage: 12, Detect (Energy): 06, Life Sense: 06, Skin Armor: 01, Telescopic Vision: 18, Bonuses & Limitations: Data Storage captures all readings taken by the lensor and can be accessed by its handlers via its controller, Detect can be used in conjunction with Telescopic Vision to extend its range), Skin Armor is Partial (-2CS Trick Shot to ignore armor)]. The main vessels were seldom seen in action, so these are only rough guesses as to their stats. NECROMONGER FIGHTER [STR 05 BODY 10, Flight: 12, Energy Blast: 12, Radar Sense: 18, Sealed Systems: 08]. SARCOPHAGUS TROOP TRANSPORT [STR 11 BODY 13, Flight: 08, Radar Sense: 14, Radio Communication: 18. The troop transports use anti-grav technology to dispense troops, allowing them to exit through bays on the lower hull and drift to the ground. This can be treated as Gliding: 01, usable on others only with an Area Effect]. FRIGATE [STR 14 BODY 18, Flight: 40, Radar Sense: 42, Radio Communication: 25, Hardened Defenses, Life Support (Full)]. WARRIOR SHIP [STR 18 BODY 23, Flight: 38, Radar Sense: 40, Radio Communication: 25, Hardened Defenses, Life Support (Full)]. CONQUEST ICON [STR 23, BODY 26, Bomb: 35, Flight: 38, Radar Sense: 40, Radio Communication: 25, Hardened Defenses, Life Support (Full)]. BASILICA [STR 25 BODY 28, Flight 38, Radar Sense: 40, Radio Communication: 25, Hardened Defenses, Life Support (Full)].